The one-two punch of hotter, drier climates and increased fires may leave plants caught out, threatening species existence in biodiversity hotspots worldwide, including Australia's south west and regions of California. Professor Neal Enright and Dr Joe Fontaine from Murdoch's School of Veterinary and Life Sciences along with colleagues from the Universities of Tasmania and Wollongong have developed a concept they have termed the interval squeeze to describe the synergistic effects of climate change and the increasing frequency of bushfires on trees and other woody plants. "Multiple extinctions are possible due to interval squeeze, particularly in regions with Mediterranean-type climates like south western Australia with its high biodiversity and projected hotter and drier climes due to interval squeeze," said Professor Enright. 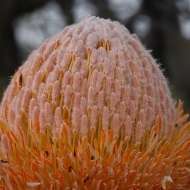 "Iconic Australian species like banksias are among the plant species facing an increasingly difficult future. "Drier and warmer conditions lead to plants growing more slowly, producing fewer seeds and experiencing lower seedling survival. In increasingly fire-prone regions the plants need longer fire-free periods to reach reproductive maturity and produce sufficient seeds to ensure self-replacement." But Dr Fontaine said the hotter and drier conditions increased fire frequency and lengthened the fire season so plants are facing an increasingly challenging environment in which to survive. "Fire intolerant species such as many Banksia species have the potential to be eliminated and more fire-tolerant, resprouting species will slowly decline in density," explained Dr Fontaine. "This is not idle speculation or in the distant future; Banksia hookeriana – a species unique to the mid west of WA and important to the flower industry has more than halved its seed production since the 1980s when Professor Enright first began measuring the species." Dr Fontaine said a previous study, led by co-author Professor David Bowman, had described widespread potential species loss and ecosystem conversion for mountain ash forests in Victoria, south east Australia following extensive wildfires since 2002 which burned 87 per cent of the species range. Some mountain ash trees regenerating after fires in 2003 and 2007 were reburned in subsequent wildfires in 2009 and 2013 while still immature, leading to complete regeneration failure and conversion of some sites to dominance by shrubs and grasses. "As ecosystems change in response to interval squeeze, other effects such as increased vulnerability to pests and pathogens may also become increasingly important, further speeding the rate of change," added Professor Enright. The effects of interval squeeze demands new approaches to fire and forest management that will maximise the capacity of plant species to adapt to climate and fire regime change, Professor Enright, Dr Fontaine and their collaborators say. "A better understanding of forest and fire ecology is needed if we are to effectively support these species," said Dr Fontaine. "Options worth considering include using predictive weather forecasting to match the timing of prescribed burns to projected post fire conditions favourable to seed recruitment. For example, the Bureau of Meteorology is now forecasting 2015 to be an El Nino year which would mean drought conditions across southern and eastern Australia suggesting caution for performing prescribed burns from a biodiversity point of view. "We could also use rapid assessment methods to determine the adequacy of seed availability for key species before burning takes place." Professor Enright and Dr Fontaine are currently developing easily implementable protocols to gauge seed population vulnerability as the climate continues to shift.